Until that day, nobody on earth knew the full story of what happened that day the bomb dropped. Those in the air knew why the bomb was dropped there, but had no idea if the people on the ground lived or died, and if they did live, what they thought of the bombing. Those on the ground did live, but they had no idea that the destruction of their little farm was an accident. All involved were forced to put their own interpretation on the event. Less honorable airmen, hardened by the destruction of war, might not have been concerned about those on the ground, and might have even laughed at the coincidence of such a direct hit. 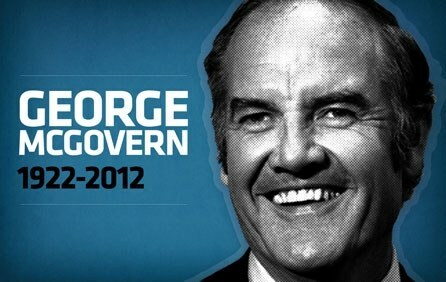 But McGovern and his crew did not laugh. They were saddened by the destruction, even though it was unintentional. And though they hoped that those who lived on that farm would have survived, they were quite sure the farmers would have been cursing those who bombed them for no apparent reason. But they were wrong about that. The farmers were so eager for an American victory that they were willing to give the American fighters every benefit of the doubt. On the ground, the Austrian family had no way of knowing the reason for the attack on their home. They wrongly assumed it was an intentional direct hit, and they thought it must have had something to do with defeating Hitler. But even though they did not understand it, they had no ill will. Terrible as it was to lose all their buildings, they chose to see their personal loss in the context of the wider conflict and larger purpose of the whole war. And they were more than happy to make their sacrifice. We are a bit like the Austrian couple that suffered a great loss for no apparent reason. There are many things that we too must suffer, and we may not see any purpose in such suffering. But we must admit that our vision is limited. God is a big God and his creation is a big creation, and we are just a small part of it. Those unfortunate farmers could have chosen to look only at the loss of their farm and the hardship that meant for them, and would have been angry and bitter about their loss. But they chose to accept their loss as just one part of a bigger plan or purpose that they did not understand. In so doing, they were content to endure the loss, and go on living without a full explanation. We all choose to view the world in a certain way. We can choose to see everything that happens only through the lens of how it affects me and what I want to do. Or, we can choose to see everything in the light of what happened to Jesus during this Holy Week. The Bible says that just as Jesus suffered, we too will suffer; but the Bible also says that just as Jesus rose from the dead to live for all eternity, we too, believing in Jesus, will rise from the dead to live with him in heaven forever. That larger vision gives us a new way to understand everything that happens to us. We can, for the time being, be like that cheerful Austrian farm couple, living and trusting in that larger purpose and vision, even when we don’t understand all the details. Jesus once said, “Greater love has no man than this, that he lay down his life for his friends.” That is what Jesus did for us that first Holy Week, and even though we cannot yet comprehend all that means, we can believe Jesus when he tells us that this is what we need most of all. Whether we like it or not, God intends to give us what we need, not what we now think we want. II Corinthians 1:2-5 — Praise be to the God and Father of our Lord Jesus Christ, the Father of compassion and the God of all comfort, who comforts us in all our troubles, so that we can comfort those in any trouble with the comfort we ourselves receive from God. For just as we share abundantly in the sufferings of Christ, so also our comfort abounds through Christ. Psalm 121:1-2 — I lift up my eyes to the mountains— where does my help come from? My help comes from the Lord, the Maker of heaven and earth. Lift up our hearts, O Christ, above the false show of things, above fear, above laziness, above selfishness and covetousness, above custom and fashion; up to everlasting truth and order; that we may live joyfully and freely, in faithful trust that you are our Savior, our example, and our friend, both now and forevermore. Amen.